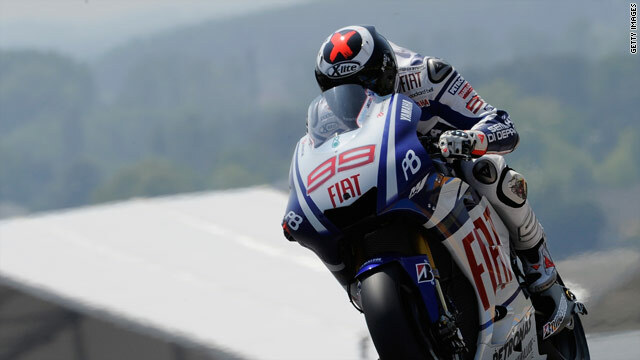 Jorge Lorenzo is now nine points clear in the overall standings after victory in the french MotoGP at Le Mans. (CNN) -- Spain's Jorge Lorenzo has increased his overall lead in the world championship standings after victory in the French MotoGP at Le Mans -- the third race on the calendar. The Yamaha rider started second on the grid behind world champion Valentino Rossi but, after briefly leading the race on lap seven, he eventually took control on the 10th lap to complete a six-second victory. Teammate Rossi finished second with Honda's Andrea Dovizioso coming home in third position. Lorenzo, who also won the second race of the season on his home track in Spain, leads the standings on 70 points -- nine points clear of Rossi. Nicky Hayden finished fourth for the third consecutive race, with Dani Pedrosa finishing fifth and Marco Melandri taking sixth position. Meanwhile, Australian Casey Stoner failed to complete the race for the second successive year after sliding out of contention on just the second lap.